With the increasing investment in autonomous technology, it seems like we’re close to living in a world where our cars drive us. However, it’s possible that the autonomous vehicle industry will begin with commercial vehicles – like tractors, bulldozers, and long-distance trucks – instead of sedans. Mining companies already employ autonomous haulers, and autonomous trailers could prove incredibly useful in agriculture and long-distance trucking. Such a move would also eliminate some inefficiencies and safety risks associated with human operation of those vehicles. The news these days has been full of stories about autonomous vehicles – Honda just spent $US6 billion to buy part of GM’s self-driving unit in an effort to dominate the automated ride-service industry. If you just read the headlines no one would blame you for thinking your next Uber ride will come without a driver. However, the most imminent and widespread use of autonomous technology likely won’t begin with SUVs and sedans, but with commercial vehicles: We’re more likely to see autonomous tractor-trailers, bulldozers, and harvesters humming along highways, digging up mining pits, and threshing through farmland. Mining companies are already deploying autonomous haulers – which makes sense, given how dangerous the job is for human drivers. Caterpillar has made an autonomous mine hauler without a passenger cab or controls, which also saves time and money for mine operators. Autonomous technology may prove even more useful in agriculture, given that farming is typically plotted geometrically – all the farmer has to do is program the tractor to go up and down, row after row, ploughing fields, seeding or harvesting. Such vehicles can even operate through the night and help extend the growing season. However, it’s long-distance trucking where autonomous technology may have the quickest and most visible impact. Given that these vehicles operate primarily on highways – where conditions can be controlled and they are unimpeded by pedestrians, traffic lights and intersections – there is great potential for self-driving trucks to pick up the slack for human drivers. Human resource savings will be a huge factor in the adoption of this technology. But there are important safety and productivity improvements as well. For example, removing fatigue-prone salaried drivers from the process will save money and improve productivity by allowing trucks to operate around the clock, 365 days a year. It could also improve conditions on our nation’s busy, and sometimes dangerous, highways. No time off. No breaks. No benefits. Reducing transportation and operational costs doesn’t come without societal concerns. From an economic theory standpoint, products delivered by autonomous vehicles should be cheaper to consumers because of the reduction in transportation costs. But if today’s drivers are not able find similar-paying jobs after self-driving technology takes over, fewer workers will have the income to purchase these products. Indeed, the social ramifications of autonomous vehicles are perhaps greater with commercial vehicles than those that may come from personal transportation and even from other new paradigms such as ridesharing, which has decimated taxi driver income in many cities. That’s because commercial vehicles directly impact people’s livelihoods – every driver whose job is replaced by an autonomous truck or other machinery is one driver who no longer has an income and is forced to adapt to this new economy. 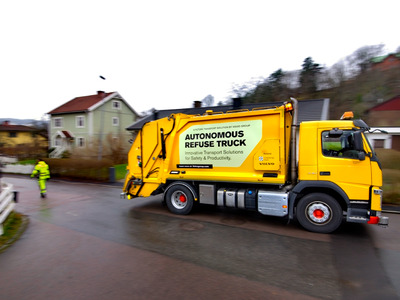 As a result, labour unions are disturbed and contract negotiations may delay some implementation of autonomous technology in commercial vehicles. But if the past is any indication, drivers will eventually adapt to the disruption and accept this change in their jobs, hopefully finding new positions either in transportation or other industries. Such a day may be hard to imagine, given that shippers currently are begging for drivers, and Amazon is planning to expand and outsource its deliveries to thousands of small independent contractors. But autonomous vehicles are quickly becoming the commercial transportation solution of tomorrow. With many companies aiming for a target of 2025 to get their vehicles on the road. Indeed, look out far enough into the future and you’ll see the next trend: autonomous drones dropping off packages, serving as the final leg of an all-autonomous delivery journey from producer to end consumer. Yes, a brave new world lies on the horizon. So buckle up. Then again, maybe you won’t have to. Daron Gifford is the automotive supplier expert at the accounting firm and consultancy Plante Moran in Detroit.